Years of Christmas baking has taught me one thing: make what they eat. There’s no point spending the money .. and the time .. to bake something pretty if no one’s eating it up. So, every year, I make what my boys (hubbs included) call, the “Un-Christmas” Christmas cookie: Chocolate chip-butterscotch chip-macadamia nut cookies. (otherwise known as “Mondo” cookies). There’s no jam, ginger or molasses in sight. I still make a few sentimental favorites but these are the ones they go back to time and again and that’s why I bother. Plus, I rarely make this version the rest of the year so, in our house, they’ve become a “Christmas” cookie in their own right. (The numbers in brackets are the quantities if you wish to double the recipe; I usually do). Who says I'm not a Christmas cookie? Using an electric mixer, beat shortening, brown sugar, milk, vanilla and egg until light and fluffy. Add salt and baking soda, mix in well. Stir in flour slowly until blended then stir in chips and nuts. Stir well until all ingredients are blended, especially any remaining flour. Drop by rounded teaspoonfuls 2-inches apart onto cookie sheets (a single batch makes about 2 cookie sheets full; double batch makes 4). Bake 12 min. (I usually cook these 6 min per pan then switch pan locations and cook another 6 min). Set pans and cookies on top of stove for 2-3 minutes before removing cookies from cookie sheet. Transfer to cooling rack and enjoy! Recipe makes 3-6 dozen cookies. These freeze well and travel beautifully, rarely falling apart in shipping. The best part? Santa loves ’em! Hubbs' idea of heaven ..
One of my oldest friends is nicknamed “Mondo”…I need to send him the link to this recipe! You’re on a roll tonight! LOL! Oh, yum. If it has macademia nuts in it, it has to be good! Thanks for sharing – I’m printing this one! Anything with macadamia nuts in it has my immediate attention! Oh MJ!!! Those look and sound fantastic! You say they travel well? Wellup! I’m gonna make these and send them to my sister in California in the new snowflake tin I just bought for her today. She’ll love them. Thanks for the recipe (and photos too). We have an un-Christmas Christmas cookie too. It’s oatmeal, white chocolate/cranberry chip. I only make them at Christmas time, but they don’t look very Christmasy. A recipe that specifically calls for Crisco? That’s a guarantee the cookies are going to be awesome! These sound (and look) wonderful, MJ. Thank you for sharing the recipe with us. Yes m’aam. 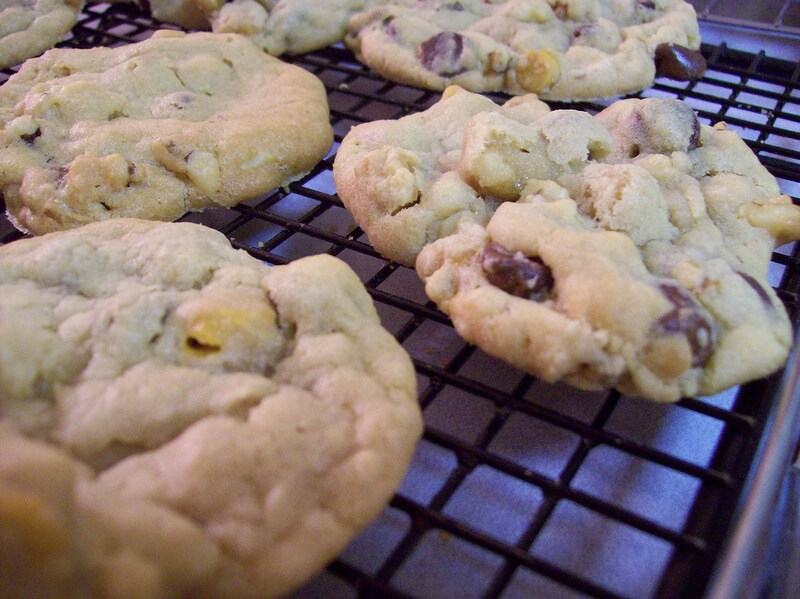 The original recipe was from a Crisco can and I’ve modified to make them into Mondo cookies. I think Crisco makes them sturdy .. butter would make them melt all over the place. Delicious! Absolutely double the recipe and make those beauties last. Thank you for sharing your recipe. Well, I’m not baking much this year, but I think these will make my short list. They look delicious! Thank you for sharing! Chocolate chip cookies are alwaysv the mainstay of our meager xmas cookie collection…no one in the house likes butterscotch except me so I don’t use them that often but these sound wonderful…. I think the butterscotch offers just a sweet surprise and contrast to the chocolate. You could cut the butterscotch in 1/2 to the chocolate 🙂 Make ’em … I dare ya!! Hi MJ. I’m so glad I found your blog again. It’s fun to read about your Christmas cookies just as I’m making a batch of my own chocolate chip cookies to send to my brothers. I always use Crisco too. I may have to try your butterscotch chips idea, though I’ll have to leave the nuts out since my son doesn’t like them. I’m sure they taste yummy with or without nuts! I’m glad you found me again, too, Jeannette! I always use Crisco in this recipe (and a few others) … they seem to always turn out b/c of it. And you can skip the nuts if you wish, certainly do-able. Another keeper – looks divine. And your recipes are alway yummy. I think it’s the Crisco that makes them so “sturdy” b/c they always turn out, they’re always yummy, and always a hit at my house. And I wouldn’t share anything that wasn’t yummy!! 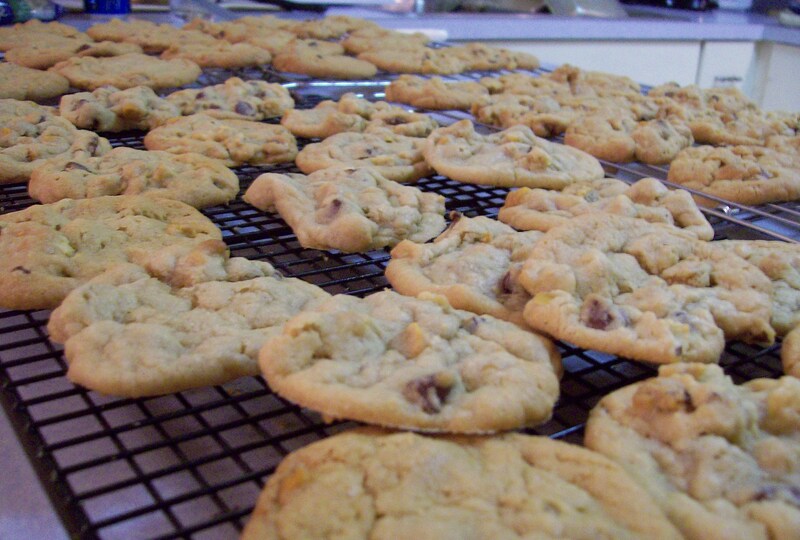 OMG those cookies look so good! I have to add them to my December cookie list. You are so right though — I love the idea of making gingerbread and all that. But I’m the only one in this house who would eat it. Guess I’ll stick with chocolate and try your recipe next.